As you might expect from the dude who recently admitted he would’ve charged even more for the drug, he’s not about to let just anyone hear the album either. In fact, even he hasn’t heard the whole thing yet: “I could be convinced to listen to it earlier if Taylor Swift wants to hear it or something like that. 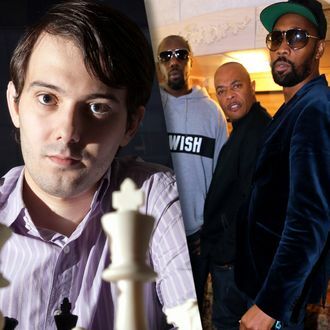 But for now, I think I’m going to kind of save it for a rainy day.” One of Wu-Tang’s terms of ownership forbids the buyer from selling the album commercially, meaning that if Shrekli’s feeling generous, he could host listening parties at his penthouse or eventually make it available to the public for free online. Needless to say, that’s a pretty big if.